Hope is a funny word. It’s one thing to “hope” you can still fit into your skinny jeans after the holidays or hope the last pair of 50%-off boots happen to be your size. It’s quite another to rush your baby to the ER and hold onto the hope that he will be OK. Or to leave your workplace for the last time and hope that something else comes along before your savings runs out. It’s one thing to toss a random wish out into the universe over something fairly inconsequential and label it as hope. It’s another thing entirely to have life slam full-force into you and be faced with hopelessness so far beyond your control, there is nothing you can do. You can’t control unnecessary, random acts of violence or unexplainable accidents. You can’t control a devastating medical report. But when those moments come, you can control where you place your hope. I’m afraid I may have left you with the wrong impression last time. You may have come away thinking I’m incredibly strong and courageous as I stare cancer in the face. I’ve had some very kind people say such things recently, and while the sentiment and encouragement is so greatly appreciated, the reality could not be further from the truth. I did not choose this battle. I did not go looking for this fight. But I’m in it, so now what? If you stake your hope in your own strength there will come a point when that strength will fail. As great as modern medicine is, and as thankful as I am for the specialists and their knowledge, there will come a point where their knowledge reaches a limit. So, where can I put my hope? When your back is against the wall, where can you place your hope? 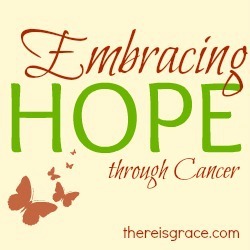 I’m excited about this new series, Embracing Hope. In the coming weeks, we’ll look at why we can put our hope in God, how we put our hope in God, and what we can do when it feels all hope is lost. I am not preaching a sermon here…I’m processing this as I walk through it myself. Won’t you come along for the journey? Hi Nancy, Our hope is best when it is focused on our Lord. His plan is written before we were formed. Praying for your strength and perseverance through this journey. Fear not, He goes before you. Stopping in from Winsome Wednesday. Kim Adams Morgan recently posted…Is Your Tongue a Gateway For Good or Evil? Thank you, Kim. Your words are so encouraging. Thank you for taking the time to stop in and comment. As I always tell my sons: courage is not the absence of fear, it is moving forward in spite of it. I’d say you have that, Nancy. And I am glad that you have your hope in God. I always knew you were a good mama, Dalaina! 😉 Such good advice. Thank you, friend! Oh, thank you sweet friend! That is so kind of you to say! Nancy, I don’t understand cancer, but I know the fear-filled thoughts. I don’t understand cancer, but I do know hardship. And I do know you have touched my heart, sweet friend. I have been so saddened to hear of this struggle you’re faced with. Anyway, I’m proud of you for writing about your journey, and I’m praying for God’s perfect healing for you and that He would use this series to help others who’ve lost hope. Thank you, Rosann. Your words are so encouraging to me, friend ! We can’t do anything in our own strength, let alone the hard things. So glad that God is guiding you to lean on him and let him be your strength through this journey. I’m here from W2W Word Filled Wednesday. Thank you so much for stopping by, Janice. Its easy to look upon the outside and not realize the battle of the mind. I have a chronic illness. I don’t want it to have me but some days it seems to h as ve the mental and physical upper hand. I chose my blog name due to suffering, hope, and the knowledge that we are His Beloved. I want to bless you with Dr Paul Youngs book. Gods Healing Arsenal. I can puchase it and send it or just maybe it will bless you knowing about it. Just let me know. It reads like a forty day devotional. He was my professor at ORU and wrote when he battled cancer. GOD BLESS. Oh so true. We can’t place our hope in things of this world or in people. We will be let down every single time. But we can hope in God and never be let down. Thanks for linking up with Woman to Woman’s Word Filled Wednesday! Join us again next week. God bless! Thanks for stopping by, Jenifer! I stumbled on a link very profound; I don’t know if I have shared it already before. You’ve probably already seen it, but it is a story about Rachel at http://www.deathisnotdying.com. She went on to be with the Lord after battling cancer, but her testimony affect me today. Her death her clasping the Lord changed me, and I think that you sharing your story here will help others too. Thanks, Nancy, for following His leading. I love the verses you used in this post! What a great statement of our hope in Christ rather than in human interventions. I will pray for you during this battle – not only for healing but also that God will always give you the encouragement you need right when you need it. Sharon Claassen recently posted…Just Praise! So very true! “They that hope in the LORD will renew their strength.” (Isaiah 40:31) Praying for you, friend. Stopping by from Mom’s Monday Mingle.